Skin is the largest organ in the body, but is often overlooked by pet owners. Pet owners are more likely to worry about possible heart, lung, or kidney diseases than skin conditions. However, dogs and cats (and their owners!) can have a significant decrease in their quality of life if they are dealing with skin disease. GCVS wants pet owners to understand some of the most common skin conditions that their dogs, cats, and other pets may face as well as how they can be treated and prevented. Allergic dermatitis: Allergies are a problem for animals, too. Pets can have allergies to foods, pollens, molds, and house dusts, just like humans. Allergic dermatitis can cause an itchy rash, redness of the skin, or even ear and skin infections. Ringworm: Ringworm is a fungal infection that causes hair loss, scaling, and inflamed skin. Since ringworm is contagious, it should be treated right away. Ringworm is contagious to humans, so avoid touching areas you think could be affected, and wash your hands thoroughly after handling a pet that might be infected. Yeast infection: Another cause of itchy, inflamed skin, yeast often affects the ears, paws, and folds. Fortunately, yeast infections are not contagious. Hot spots: Hot spots are caused by excessive licking, biting, or scratching one part of their body – generally due to an underlying condition. These spots, most often found on dogs, can go from the size of a quarter to the size of a grapefruit in hours and are red and swollen. Hot spots may ooze pus or a watery discharge. Hot spots can have a foul odor as well. Hair in the affected area may also fall out (or be chewed out). Lick granuloma: Much like a hot spot, lick granulomas are chronic self-inflicted sores caused by excessively licking an area of skin Lick granulomas can cause redness, hair loss, and often deep infections. This condition is sometimes anxiety-related and can be the result of separation anxiety, boredom, lack of socialization, and stress. Frequently it is related to allergies, but can also be a result of parasites, tumors, or other causes. Flea allergies: Parasites like fleas and ticks are an annoyance, but in some pets can cause allergic reactions. If your pet is allergic to flea saliva, the skin where flea bites occur can become irritated, red, and itchy. Additionally, the fur in the affected area can fall out or become discolored, brittle, and dry. Mange: There are two different kinds of mange in dogs: sarcoptic and demodectic. Both are caused by an overabundance of mites on or in the skin. Sarcoptic Mange: This type of mange is also known as scabies. Sarcoptic mange is very itchy and highly contagious to both pets and humans. However, it doesn’t typically live long on human hosts. Demodectic Mange: Demodectic mange in dogs is not contagious; one form in cats can be contagious. This mite causes air loss, redness, and other signs. When you go in to see a veterinary dermatologist, they will be looking at your pet’s combination of symptoms, as well as diagnostics such as skin scrapings, allergy testing, and microscopic evaluation, to determine what type of skin condition that they are most likely dealing with. Once a diagnosis has been made, the veterinary dermatologist will decide on a course of treatment. There are multiple treatment options for environmental allergies (atopic dermatitis), including oral therapies and allergy serum. When it comes to food allergies, your veterinary dermatologist can help you determine an appropriate diet for your pet that excludes any problem foods. Treating parasites (fleas, ticks, and mites) has become much more easily managed in the past few years. There are multiple effective treatment options that do not involve messy options such as dips or powders. Infections will often be treated with oral medications (antibiotics or antifungals) as well as topical therapy (shampoo, creams, ointments, sprays, etc) or a combination of these. Controlling allergic reactions depends on the type of allergy that is affecting your pet. Food allergies may require a specialized diet to avoid flare-ups. Environmental allergies can be controlled through medications or allergy serum. Allergy serum is often recommended as a long term therapy. 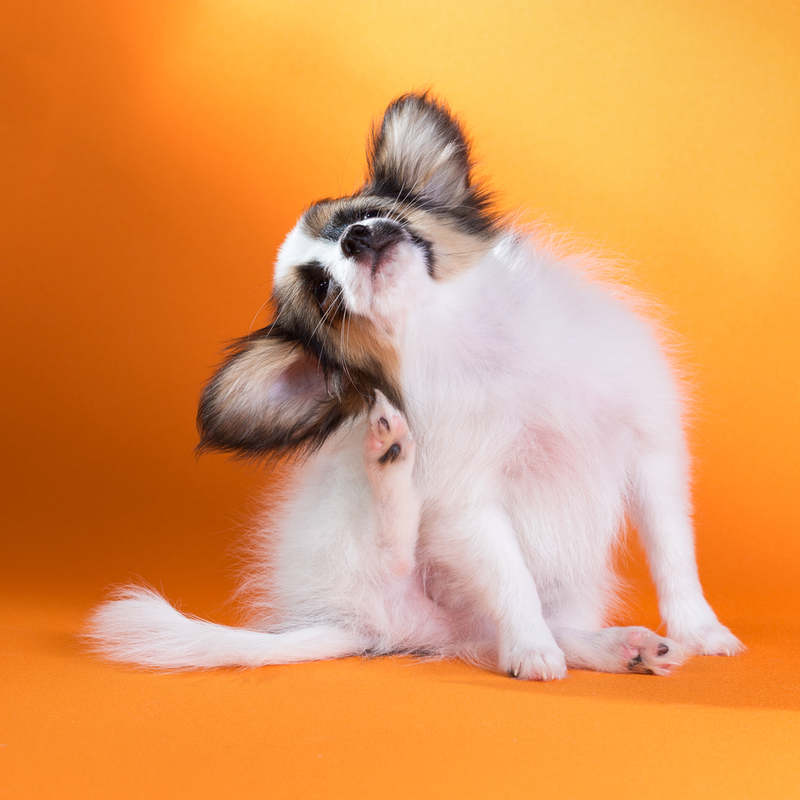 To prevent pests like fleas and ticks, consider using an oral or topical medication for your dog. The preventative products, when kept up, should keep your dog from getting into trouble with fleas and ticks. If your dog or cat is developing frequent ear or skin problems then a work-up should be performed to find out the underlying cause. If you are able to identify the primary cause of the infections, it is much easier to prevent them from recurring. If you believe that your pet is suffering from a skin condition that is causing discomfort, have your family veterinarian contact GCVS right away. Our dermatology team can diagnose your pet’s skin condition and provide treatment that can give your pet relief from the pain, inflammation, and itchiness caused by skin problems. To set up an appointment, call 713-693-1111. GCVS is located in Houston, Texas.